How can I add “label” information to my MP3s? I've been listening to the recent All Songs Considered podcast, Do Record Labels Matter and I'm inspired to start adding record label information to my MP3s. I don't see an obvious place to put that information; is there something that others use? Is there any movement in the standards body to add such a field? I recommend using the MusicBrainz Picard tagger to tag your mp3s. MusicBrainz is a community music metadatabase that attempts to create a comprehensive music information site. You can use the MusicBrainz data either by browsing this web site, or you can access the data from a client program — for example, a CD player program can use MusicBrainz to identify CDs and provide information about the CD, about the artist or about related information. You can also use the MusicBrainz Tagger to automatically identify and clean up the metadata tags in your digital music collections. Find out more in the introduction. As well as high quality album and artist data, the database holds record label information. Eg: Rough Trade. Providing it's in the database, tagging your music with Picard will set the label in the ID3v2 Publisher field. You'll also get release dates, (optionally) genre and more. And the database is editable, so if it's not in there, you can add it yourself. The ID3v2 standard tags have a 'Publisher' field. Definitely more appropriate than using the 'Comments' field. 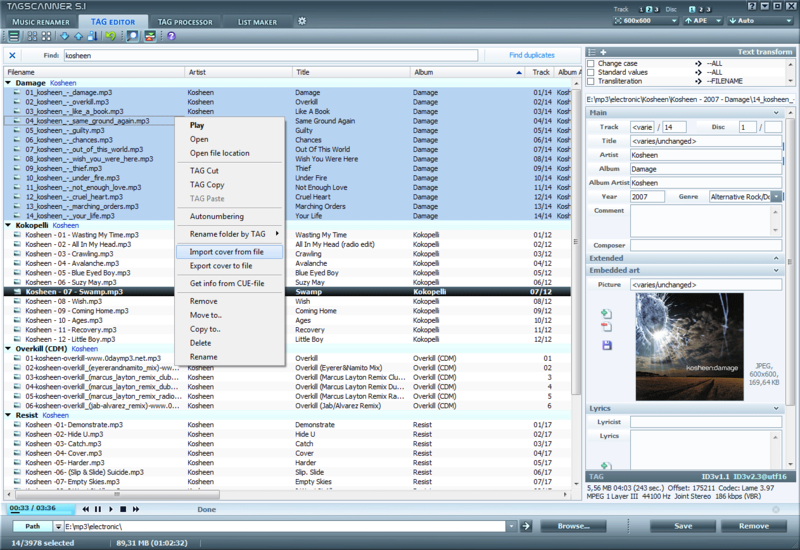 I use Mp3tag where you can add the publisher field via 'Tools > Options > Tag Panel'. The most common MP3 meta-data standard is the ID3 tag. ID3v2 specifies both standard tags such as Album, Track Number, Disc Number, etc, but also allows custom tags to be created. Your best bet is to review the standard tags and see if there is one for your needs; if not then appending a custom tag will be the way to go. Mp3Tag is a solid little utility for working with ID3 tags. As mentioned, the ID3v1 and ID3v2 standards define a mechanism and syntax for storing metadata in the MP3 file itself. Many MP3 players, from car stereos that play data CDs loaded with MP3s to Ipods to Windows Media Player can read this data from the MP3 file itself. The data is stored in the file itself, in a special part of the file. One section of the file contains the encoded sounds, the music, and another contains these tags. Most of my MP3 files contain both ID3v1 and ID3v2 tags, in addition to the encoded music, so that wherever I play the MP3, I can see the track name and artist name and so on. There are several databases of tags out there on the interest. Music Brainz is one. FreeDB.Org (http://www.freedb.org/) is an older one. If you CD ripper supports accessing such databases, getting your MP3 files tagged is a snap - usually there is an option to query the database, and then you have a bunch of tags that match the CD you just ripped. Some media applications do this automatically for you. I like Foobar2000 for seeing, and setting, all tags including arbitrarily named tags. I like MP3BookMarkHelper for setting/changing tags for a group of files, for example a multi-CD recording where I want to change the Artist tag for all the tracks. The one thing I have found, especially with classical music, is that many people have different opinions about the "correct" way to tag MP3 files. For example, should the composer be the Artist? Should the Conductor be so enshrined? What about the orchestra or string quartet? A nice feature of ID3v2 is that there are many more tags defined in the standard, and it also supports the creation of custom tags, so you can tag your files in a way that you like. I use TagScanner for that. Not the answer you're looking for? Browse other questions tagged mp3 music or ask your own question. Simple way to increase volume on MP3s? How do I connect an iPhone to my PC to load MP3s to it? How can I detect errors (bleeps) in MP3s? How to add album art (picture/jpeg) to MP3s with ID3 Mass Tagger?